Yes! Lions are the top predator in the African ecosystem where they live. They are also the most social of felines and are the only cats to live in groups (prides). 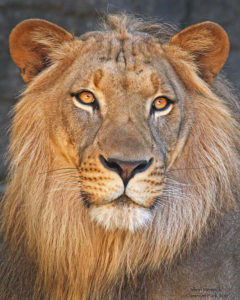 Lions are the largest member of the cat family and the largest of all the African carnivores. Adult males average up to 420 pounds and female can weigh up to an average of 265 pounds. Females are the primary hunters in the pride. Lions feed on large hoofed animals that are found in the lion’s grassland, savannah habitat throughout the south Sahara desert and in parts of southern and eastern Africa.